Free Printable November 2019 Calendar. 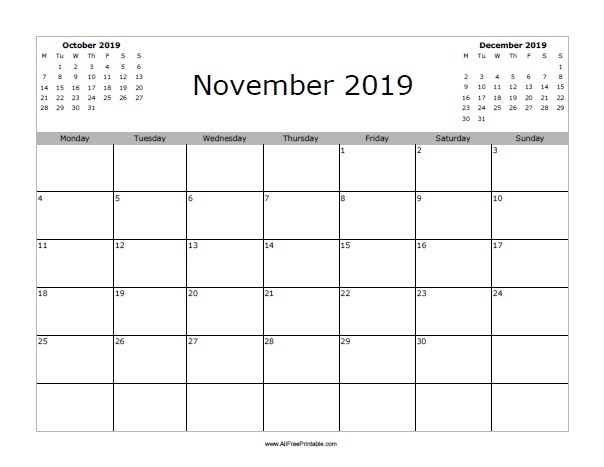 Free November 2019 blank Calendar to print and make planning easy for the office, school or home. Great free calendar that includes previous month October and next month December. Select from 2 calendar options, starting the week on days Monday or Sunday. Useful free printable November 2019 calendar to write important notes like Thanksgiving church activities, family dinner, vacations, travel, meals planning, shopping, loan due date, Black Friday, cleaning days, house decoration, grocery, things to do at home and more. Click the link of your choice to download or print now.